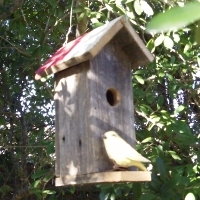 To build a birdhouse, you don't need many tools, but there are a few that make building bird houses simple and easy. Outside of the essential carpentry tools, the only tools I used to build these projects were: a miter saw, a finish nailer, and a power drill (to drill the hole so that the birds can get in). 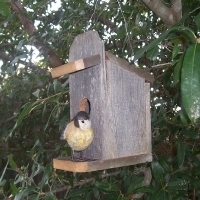 I hope you enjoy building these bird house plans and the other woodworking projects featured on mycarpentry.com. As you build each project, you may discover your hidden carpentry talents, and think of new ideas for your own custom carpentry creations. 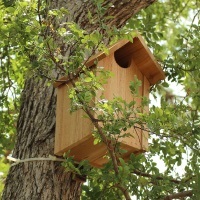 Outhouse Birdhouse - this easy-to-build bird house is designed to be used by wrens or house finches, but other small birds might find this particular design suitable for nesting. Owl House Plans - these owl house plans are designed for a Screech Owl or a Boreal Owl. The base is 8" x 8" and the inside height is 15". This owl house is made of western red cedar and took about two hours to make. The General Store - this birdhouse gets its name because it has the look of the store front of an old country general store. It was made from a single 1" x 4" cedar fence board. It took less than five minutes to build and, since the fence board was used, the only cost was the brads and wire that it took to hang it from the tree. 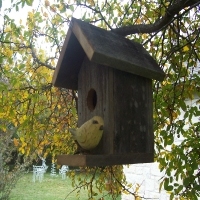 The Classic - this classic style birdhouse was made from a single 1" x 4" cedar fence board. It took less than five minutes to build and, since the fence board was used, the only cost was the brads and wire that it took to hang it from the tree. The Tall Texan - this birdhouse, dubbed the Tall Texan, gets its name because of its height, but also because its roof is painted with the colors of the Texas flag. Visit eBird to learn more about birds and discover the world of birding. Leave Build a Birdhouse and return home.